This photograph has been scaled down; full resolution photograph is available here (1,000 by 644 pixels). It is horrible, they should have put more thougth into it before they started the war. It is horrible, they should have put more thougth into it before they started the war. Place the photos of Nangking next to this photo. "Tough pooopy.. Did you see what those vile scumbags did to others? They got less than they deserved" Yeah, they themselves committed atrocities in China, and elsewhere in the Pacific. There is absolutely no excuse for that. But, an eye-for-an-eye attitude will only doom us to go through this kind of tragedy again and again. Who are you to say what justice is? 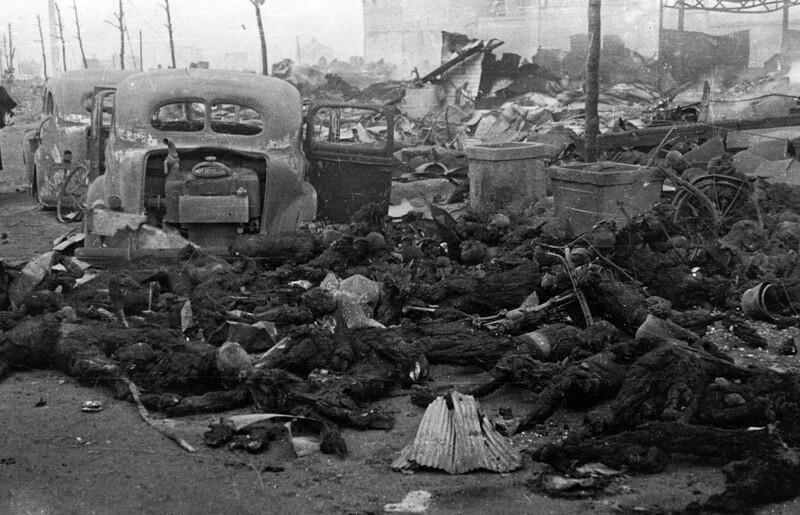 Americans taking skull trophies, LeMay's Tokyo bombing would have been seen as war crimes/crimes against humanity had the Japanese been the one's to dispense victor's justice. You also refer to 'those' - as if all Japanese, civilians included, were some kind of homogenous group that all thought about the war the same way. There would have been plenty in those 100,000 that thought the war was pointless, but were too afraid to speak out. Your comment shows nothing more than sheer ignorance. Navy corpsmen helped a wounded Marine to reach an aid station, Iwo Jima, Feb-Mar 1945. Note crushed Jeep and submerged M4 Sherman tank.